An easy way to adjust brake shoes. This idea might be easier than the method you currently use. When it comes time to adjust the brakes, this is what worked for me. This method is very simple and eliminates the need for special tools to measure the brake drum diameter or adjust the star wheel through the hole in the backing plate. It works for drum brakes, front or rear. First, perform the needed repair or replacement of the drum brake system, be it a rebuild or just new shoes. After installing new brake shoes, it is always necessary to adjust the shoes to obtain the proper friction inside the drum. This example is for the rear drums, but the front drum adjustment procedure is about the same. Step 1. If the drum has a little friction from the brake shoes when you slide it on, that's good! So, before bolting the wheels on, try to adjust the star wheel so there is at least a little friction, but not too much. Do the same for both rear drums. Step 2. Mount your rear wheels. Step 3. Chock the front wheels. Put a jack under the rear differential and lift the rear axle up enough so BOTH rear tires are off the ground. Have a helper REPEATEDLY press and release the brake pedal WHILE you spin the rear tire in REVERSE. 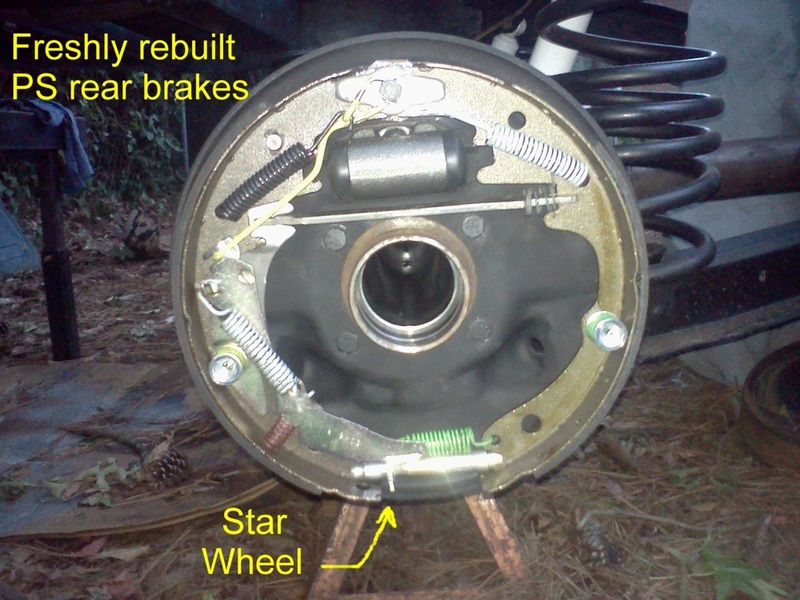 You should hear and maybe even feel the star wheel adjusting the brake shoes to the correct tension. Do this on the other side. Repeat the process UNTIL YOU CAN NO LONGER TURN THE TIRE BY HAND while the brakes are on. Always check your newly installed/adjusted brakes in a safe area in case of unexpected failure. Why does this work? Well, the star wheel is a design feature that SELF ADJUSTS the brake shoes - but it is only activated by applying the brakes while driving the vehicle in reverse. We usually back up our vehicles several times per day, so the mechanism will keep the brakes properly adjusted as long as they are properly maintained.